Jesus The Radical Pastor: "Labor" Days---Oh, the Beauties! On this Labor Day 2006, Julie and I are celebrating two other "labor" days--the day that Lillian was born to our daughter Elisha and the day Sylvia was born to our daughter Leah. As you observe the pictures Lillian is on the right with me and Sylvia is on the right with Julie. 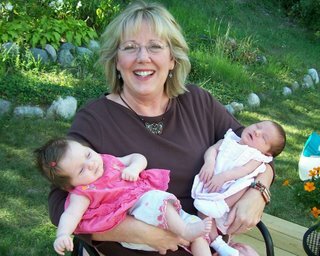 Each new granddaughter has two older brothers: Lillian's are Benjamin and Zachary and Sylvia's are Jackson and Trevor. The lucky Dads are Bryan and Andy. Each set of boys and girl has an Aunt Lori and Aunt Shamar, our two other daughters. For Julie and me, holding little girls is deja vu all over again. It is wonderful! Now, Leah, how did you know?? Congrats to the proud grandparents. Thanks, Kris. They are so cuddly. It must be in the drink!" Do any of the clan happen to bear "Frye" as a middle name at least? Speaking of babies, 4 of our 5 kids share your town of birth - Waukegan, IL! Those pictures look like they should be framed. Congratulations! "Frye" is yet to be tagged on any one of them. I'm afraid I'm the end of the "Frye" line. My birthplace was Corinth, Mississippi. I worked in Waukegan, IL for a few years at my stepfather's Mobil station. Is it you or me who has been tagged? Just kidding. How are things in the wild, wild west? You CAN'T tag me. I've already been tagged---see JTRP blogspot, Tuesday, Aug. 8. Those are the cutest doggone pictures! Thank you so much for sharing -- such happy faces all 'round. We have the cutest doggone kids and grandkids. Thanks for stopping by. It reminds me of my twins (they're 14 now). 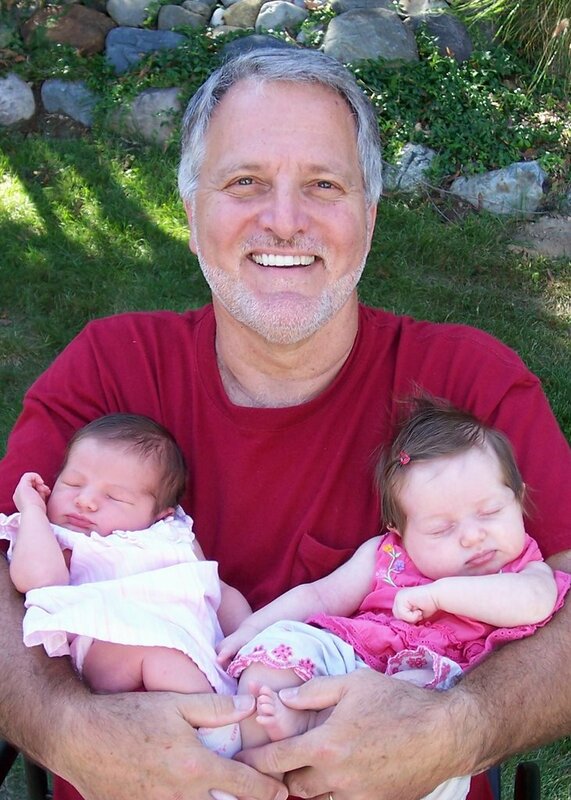 When I was holding the two babies for the picture I asked my daughters, "How would you do it if you had twins?" They both just rolled their eyes and went "Oh, no." Thanks! I love being "grandpa John."